The 8 Best Seafood Restaurants in Wyoming! Just because there isn’t an ocean nearby doesn’t mean Wyoming isn’t tops when it comes to delicious seafood. From dark-wood French bistros with world-class raw bars to elegant eateries serving up perfectly-prepared lobster, you’ll find just the dish you’re looking for at the best seafood restaurants in Wyoming. This stylish eatery perfects the melding of approachability and refinement. The supremely modern yet warm decor is immediately enticing: it’s sleek and futuristic, yet simultaneously warm, pleasantly lit, full of natural vibrancy. During warmer months, this vibe extends to the lively outdoor patio, an amazingly jovial place well suited to the menu’s fresh, local and expertly-prepared seafood (and meats). The crudos and first courses are stellar: the hamachi & yuzu and escolar & ponzu are bright, bold and clean. For entrees, the local trout, caramelized scallops and red snapper all evoke the ocean in the mountains of Wyoming. With a population less than 2,000, Afton is an unassuming town tucked into a scenic corner of Wyoming’s southwest. More famous for its natural panoramas, Rocky Mountain Seafood is a gem. This no-nonsense fish shop evokes the stripped-down seafood oases along America’s coasts: chalkboard menus, wood-plank decor, and a glass case full of brilliantly fresh fish. Simple and good. Simply walk in, approach the counter, point and enjoy. With both premium farm-raised and Alaskan product, the variety of salmonids and whitefishes is extraordinary. 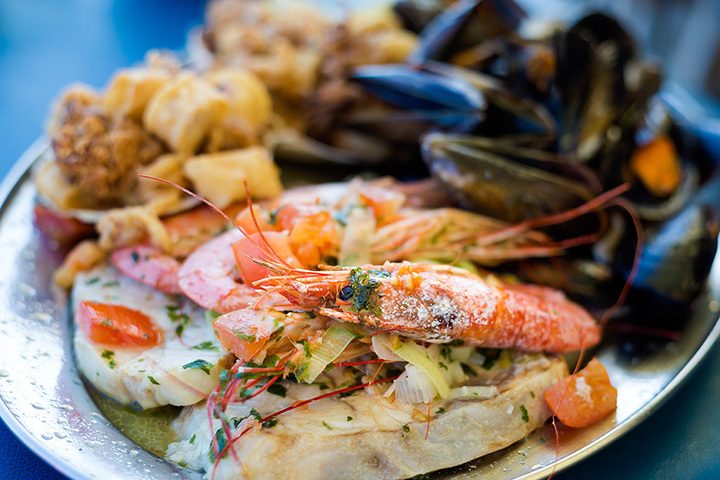 Chow down on an excellent fish basket for lunch, with a dozen options, from clams to haddock. And make sure to leave with some fresh fillets to relive the dining experience at home. Depending on the context, the translation of rendezvous can mean an appointment, a meeting or a date. At this Jackson Hole institution, the term more appropriately refers to a gathering of food lovers. And, here, it’s hard not to fall in love. Since 2001, this simultaneously unpretentious and Continental-European classy restaurant has entertained, comforted and sated a host of families, celebrities and locals. The bistro vibe permeates everything: from the tablecloths to dark-wood chairs and classic French-American fare. The signature raw bar is exceptional, with oysters on the half shell, tartare, and even shellfish shooters. More substantial seafood delicacies include the black cod, accented with Asian flavors, and the perfectly-seared scallops. Poor Richard’s is a classic haute restaurant. It evokes the nostalgia of classic dishes with parsley and cream, white chef coats and perfection of the simple sauté. For years, this proudly “fancy” establishment has given Cheyenne locals (and tourists) a taste of the high-end, of the royal foods of monarch’s past. Those with discerning palates and a penchant for the Classics will be delighted adjectives like “petite”, “Rockefeller” and “tournedos.” As far as seafood, rejoice in the tried-and-true delicacies of lobster tail, oysters on the half shell or a soul-satisfying cioppino. The James Beard is akin to an Academy Award for chefs and restaurants. Nora’s won the award for “American Classics,” and this rural culinary hub continues to exude approachable refinement. A giant salmonid sign is unmissable, just off highway 22, and the high-quality seafood is well known. Once inside, stained glass lamps, formidable pine furniture and stone hearth are all warm and inviting. With a hodgepodge of local favorites like burgers and a delicious chicken fried steak, it’s the trout here that’s plain fantastic. It’s fresh and grilled right, simply adorned, and served by happy locals. Few hotels are as synonymous with luxury as the Four Seasons. And cradled by inimitable Teton wilderness and a renowned ski resort, the Westbank Grill has the potential for “memorability” at its fingertips. With a robust menu of refined mountain cuisine, bolstered by European precision and execution, any palate will be sated, especially by the seafood. A deliciously-memorable splurge starts with a half dozen raw oysters, wading in a tangy mignonette, or skip to the deep end and tackle the “Grand Tower”: a $120 spire of lobster, King Crab and prawns. Or try the more affordable entrees of crispy trout or salmon with romanesco and soubise. Renowned for its seared meats and poultry, the Rib & Chop House also tames flames for properly grilled seafood. For well over 15 years, this multi-state meat-magician provides families and hungry passers-through with heaps of well-cooked protein by downright friendly servers and bartenders. This Rocky Mountain genuineness permeates the staff and menu, radiating a comforting dining experience, with warmth from decor and hearty fare alike. The simply-fried and straightforward catfish or fish & chips are always a hit, as is the salmon (atop cedar) and shrimp jambalaya. Saratoga, Wyoming, is relatively unknown, unless one works in the Forest Service or seeks out destination hot springs. But like this beautifully forested town, Bella’s visceral quaintness belies an enjoyable, sensual experience. The neon green building, bright shutters and welcoming patio hint at the playful elegance within. House-baked bread and homemade everything underpins a truly delicious and satisfying meal, all framed by family-centric Italian cuisine. The bacon-wrapped shrimp selentino are savory and balanced with tart greens, and the gamberetti e carciofi is a delicious bowl of linguine with seafood and artichoke.